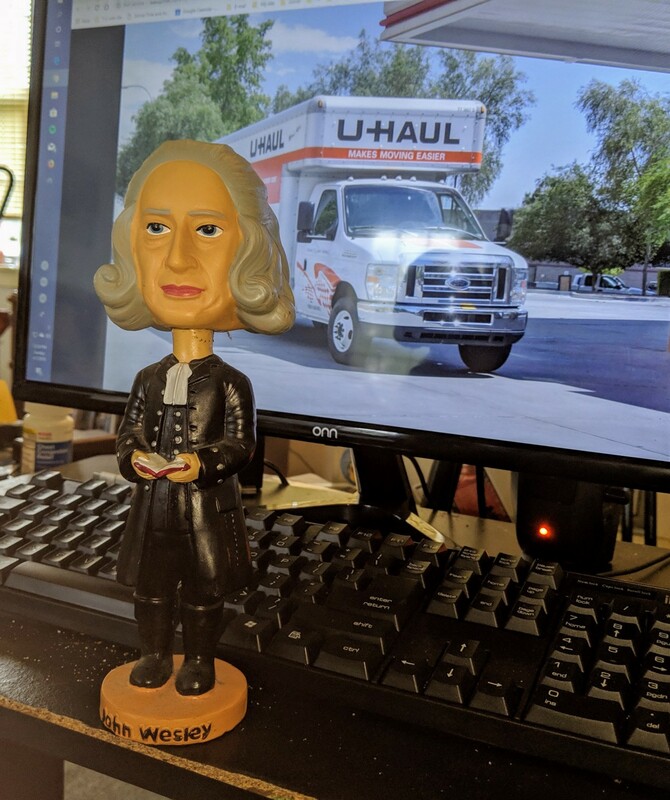 John Wesley, the icon (though not the sole founder) of the Methodist movement, was a big believer in itinerancy — moving preachers from one place to another. He felt that a change in preachers energized the congregation. “Were I myself to preach one whole year in one place, I should preach myself and most of my congregation to sleep,” wrote Wesley in a 1756 letter. Itinerancy moved across the pond when Methodism — which had, up to that point, been a reform movement within the Church of England — became its own separate church in the newly-indpendent American colonies. It has continued ever since, although in recent years I don’t think preachers are being moved quite as often as they were when I was a child and my father first became a United Methodist pastor in the early 1970s. The late Rev. Aileen Massengale once said that a Methodist minister had to be prepared to eventually do two things: die, and move. I remember our moves when I was living with my family. When I used to attend Wartrace United Methodist Church, one of our pastors was Diana Hough (now Diana DeWitt). Diana had energized the church and brought in some new members — including some from outside Methodism who had no idea what itinerancy meant. When Diana announced that she was being transferred, it blew their minds. What’s wrong? Who can we talk to to stop this from happening? Lanita Monroe has brought that same kind of energy to First UMC Shelbyville, my church home. This morning, we found out that we will be losing her this summer. She is returning home to Fairfield Glade, where she used to be an associate pastor, as senior pastor. We were all shocked. Even if you know about itinerancy, even if you believe in itinerancy, that doesn’t make it any easier to lose someone who has meant a lot to the church. Lanita has brought a lot to our church — and not only the church, but the community, through her role in things like the Community Soup Kitchen and A Celebration Christmas. She was someone I could always stop by and talk to if something was bothering me — and even though what was bothering me was usually something pointless and minor, Lanita would always be there to listen. Our new pastor will be Paul Mullikin from Ripley, in West Tennessee. He will start July 7. I have — I admit — looked him up on Facebook, and he has a friendly face. I look forward to meeting him, and I know God will teach us things through Paul the way he taught us things through Lanita, and Lloyd, and Jon, and so on. By chance, we had a fund-raising spaghetti dinner right after church today, and someone made the comment that Lanita’s departure would be harder to take if we didn’t know that she was going home — to a place she loves and where she is comfortable and where her son lives. In the meantime, we will enjoy our last few months with her, and celebrate the blessing she has been.